Load Check II continuously detects hoist overload conditions throughout the frequency range, halting upward motion and only allowing the load to be lowered. It continuously monitors the hook load, both during acceleration and constant speed, eliminating the need for load cells in most applications. Its new auto-setup feature will define the hoist’s maximum hook load in seconds. Load Check II detects overload conditions when loads are “snagged” during low speed operation. With these control advancements, the drive will either pause lifting only when the rated capacity is approached or instantaneously halt. These enhancements provide increased accuracy and productivity. Safe Torque Off provides a redundant hardware safety circuit that guarantees motor and brake power are removed when an E-STOP switch or safety controller opens the drive input, eliminating the need for external disconnects. This functionality is provided in a safety category 3 architecture, and designed to PLd and SIL CL2 according to ISO/EN 13849-1 and IEC/EN 62061 respectively, meeting the requirements of IEC/EN 61508. Drive setup is even easier with the new Quick-Set parameter group. The drive populates a single menu with the most frequently used parameters based on the motion and speed reference selected. For example, when a 3-step traverse drive is configured the three speed reference, two acceleration-deceleration, programmable input, motor FLA, and Reverse Plug Simulation™ parameters are all added to a convenient single menu. Provide the drive flexibility needed with expandable AC digital input and output, DC digital and analog input and output option cards. Simplify automation and diagnostics integration with our Ethernet IP, Modbus TCP/IP, and PROFIBUS-DP option cards. The new control power supply option maintains diagnostic, I/O and communications when main power is disconnected from the drive. Basic and Wireless Diagnostics Systems (WDS) provide easy parameter management with your PC. WDS can communicate with up to 31 drives remotely, allowing wireless drive diagnostics, monitoring, and programming. Magnetek drives are designed with reliability and economy in mind! The hardware and software were designed and extensively tested specifically for the operating conditions seen in overhead material handling applications. These durable drives feature new power modules which can withstand four times more thermal cycles than previous generations. Preventative maintenance monitors provide the feedback you need to schedule maintenance and minimize downtime. 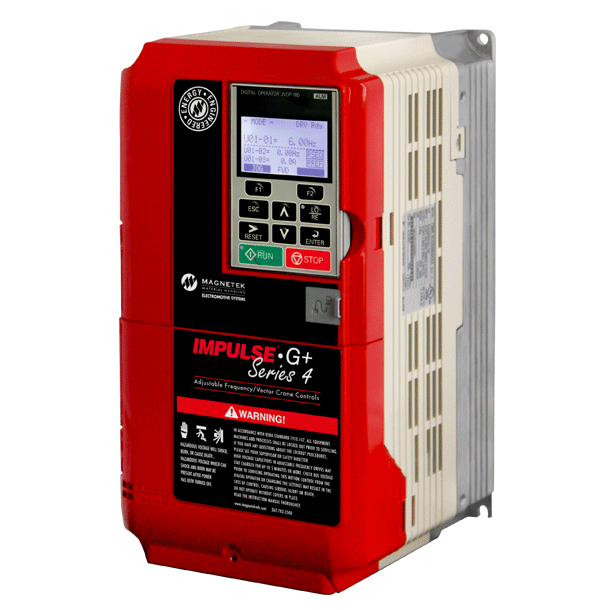 IMPULSE•G+ & VG+ Series 4 drives are backed by our industry-leading three-year warranty.